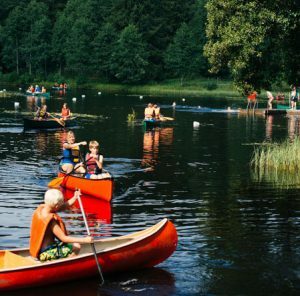 Welcome to a campsite at the heart of Värmland with room both for a cozy camp with your scout troop and larger camps with thousands of participants. We can also offer conference facilities with accomodations both inside and outside. For our camp guests we have water closets and shower possibilities adjacent to the campsite and also access for bathing. We also provide help with planning of menu, access to commissariat, hiking trails, activities and program boxes. Year round. During the winter by arrangement. You will find Scout Camp Ransberg in the heart of Värmland only a few km Ransäter and a little more than an hour from Karlstad by bus. The bus schedule in found on www.varmlandstrafik.se. Closest bus stop is “Ransäter kyrka”. We have a kiosk where you can buy sweets, ice creams, Ransberg merchandise, postcards and stamps. Next to the campsite we have water toilets and shower facilities. Firewood and poles are included in the fee. It is possible to rent tents and patrol boxes with cooking equipment and other camping equipment. Ransberg has a large number of activities that come in so called activityboxes that include the material and instructions you need. Just pick a box and start right away. We have activityboxes for all ages and group sizes. Some examples of activities are batik, soapbox race, impro theatre and a treasure hunt. For the really adventurous we have a specially built obstacle course that we call Survival Track. Survival Track is a 500 meter long adventure track with 15 obstacles of different size and level of challenge. A lap takes about 30 minutes depending on the size of the group. Ransberg can offer a nine hole disc golf course. The course takes you around the main house of Ransberg and gives you an opportunity to both enjoy the calm and silence of the century old manor and the adrenaline rush of the game. 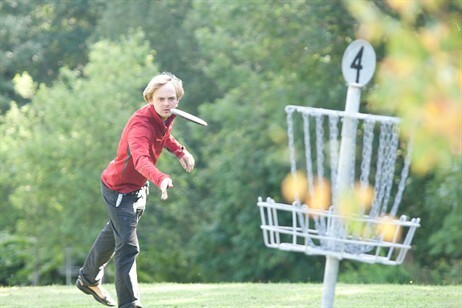 The disc golf course can be played from early spring to late autumn and there are discs for loan. 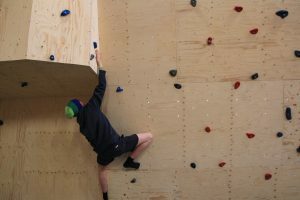 In the great barn of Ransberg you will find a nice and challenging climbing wall with four different levels of difficulty. We also have a lower bouldering wall with a variety of problems to climb. Our staff have training in belaying and can be of service if needed. If someone in your group have the the skills needed for safe climbing the wall can be used without a guide. Right next to the main buildings of Ransberg we have a small pond with a beach and pier, ideal for a quick dip or watergames. About 5 kilometers up the road from Ransberg is Ransjön with a larger swimming area. The small lakes around Ransberg provides excellent fishing. You can buy your fishing license at Ransberg. Ransberg have 12 canoes for rent including paddles and life jackets. The canoes are loaded on a cart and our staff can help you transport them to a location of your choice. In our reconstructed prehistoric settlement you can experience what life was like in the stone age. People of today might have something to learn from ancient techniques of fire making, fishing, bread baking and other means of survival. You can choose between a staff guided experience or to use our written manuals and premade materials. Next to the campsite is a football field and by the pond you find a volleyball beach. Balls and other required materials can be lent. We rental bikes if you like to experience the Värmlandian countryside from the saddle. The nearby Klarälvsbanan offers a flat and beautiful tour all the way to Karlstad or Hagfors. Ransberg is run by a small number of hired staff and a crew of volunteers who work from a few weeks to the whole summer. Most staff are members of the Swedish Temperance Scout Association. You recognize the staff on their blue t-shirts.